Note: These Cignal denominations are processed by Smart, and are auto-topped up to subscriber’s account. In any case of top-up concerns, please contact LoadCentral customer service representative. 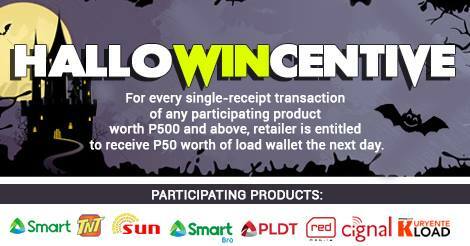 LoadCentral, in partnership with Smart Communications, will be rewarding retailers for selling Smart CRG products. For every single-receipt transaction of any product from Smart CRG worth P500 and above (Smart, TNT, Red, Sun, Meralco load, PLDT, Cignal), retailer is entitled to receive P50 worth of load wallet the next day. Higher sale means more incentives. LoadCentral will send the load wallet incentive to the retailer’s account the following day.